MIAMI, November 14, 2015. Larry Smith leads an intimate dinner-time conversation at the 2015 Summit at Sea conference. 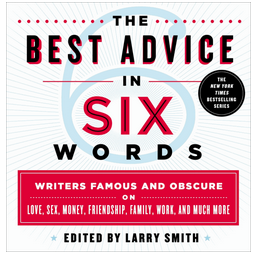 Join Larry Smith, Jeni Britton Bauer, Piper Kerman, and other local storytellers in a special Six in the City: Columbus event to celebrate the release of “The Best Advice in Six Words” from the Six-Word Memoir project. As part of the gathering, all attendees are invited to share their own six-word stories in the form of advice, a story about Columbus, or what Jeni’s means to them. Prizes (books, ice cream) will be awarded to audience favorites. Want to hold you own BEST ADVICE book reading? We’ve booked these “official readings” above and encourage you to organize your own Six-Word Advice reading — at your local bookstore or café, in your home, or anywhere where people enjoy gathering. Check out what Six-Word Memoirist Beth Carter organized at her local book store. Let us know what you have planned and how we can help.